Frank Capra’s inspirational Mr. Smith Goes to Washington is a magical, patriotic, and incredibly progressive example of how much power films can hold while still being fun and humorous. The first time I saw Mr. Smith was during a sleepless night at film school – it was my very first exposure to Frank Capra, and one of the oldest films I had ever seen up to that point. The magic held by the film still hasn’t worn itself out, as evidenced by its position on my list. Mr. Smith Goes to Washington tells the story of the wholesome young Jeff Smith (James Stewart) who is unexpectedly hand-picked to be the Senator of his home state of Washington. Once he arrives in D.C., he is taken under the wing of Senator Joseph Paine (Claude Rains), who pushes the young man to keep busy by proposing his own bill. The ambitious but dearly naive young man is very quickly taken advantage of by the press, and by other Senators. Senator Paine and the sinister Jim Taylor (Edward Arnold) plan on passing a dam-building bill through the Senate, and find Jeff Smith as their only form of opposition. With the help of his tough secretary Clarissa Saunders (Jean Arthur), Jeff will do whatever it takes to stop the dam from being built. When people bring up patriotism in movies being a negative, I often tell them about how effectively it is used in Mr. Smith Goes to Washington – perhaps one of the most patriotic and proud films about America ever made. It wears its patriotism and sentimentality on its sleeve, and yet manages to be full of compelling characters, situations, and heart. Frank Capra’s films were very often wholesome and playful in nature, with themes of identity and camaraderie often coming into play, and Mr. Smith is no different. While it may not be as sweeping and epic as something like It’s a Wonderful Life, Mr. Smith’s small scale story is personal enough to be every bit as effective as Capra’s holiday classic. Sidney Buchman’s script brings the classic fast-talking dialogue that Capra was so famous for, establishing a number of strong and smooth talking characters in Jean Arthur’s Clarissa Saunders and Claude Rains’ Joseph Paine, both of whom talk circles around Stewart’s Jeff Smith at first. The young hand-picked Senator is quickly able to match their speed, ultimately leading to the film’s incredible filibuster scene – one of James Stewart’s finest moments as an actor. Stewart’s performance as Jeff Smith is phenomenal – he easily portrays the quintessential screen underdog, biting off far more than he can chew and doing battle with the most powerful men in America. Stewart brings his usual “aw, shucks” attitude and amplifies it for Smith’s naivety in the first act of the film, but the rose-colored glasses eventually come off and Jeff Smith’s romantic idea of America is crushed before his very eyes. Watching the evolution of Smith over the period of just two hours is one of the most profound experiences you’ll find in Hollywood history. 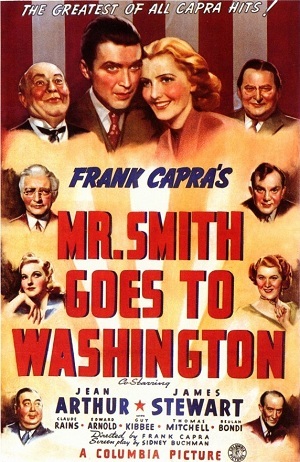 Mr. Smith Goes to Washington is the quintessential Frank Capra film – it’s filled with broad humor, memorable characters, and some of the most iconic and inspirational moments in movie history. To read my full thoughts on Mr. Smith Goes to Washington, you can check out my full review here. Rear Window is the Master of Suspense’s single greatest achievement as a filmmaker, creating one of the most thrilling mysteries of all time – yet the entire film takes place in a single location. Rear Window follows L.B. Jeffries (James Stewart), a photographer who has recently broken his leg in an accident. Confined to a wheelchair in his small apartment, and with a limited number of visitors (mainly his girlfriend Lisa (Grace Kelly), and personal nurse Stella (Thelma Ritter)), boredom begins to set in for Jeff – he begins to watch his neighbours through the window. Since all of Greenwich Village is seemingly enduring an ongoing heat wave, the entire apartment complex is on display to Jeff, who begins to notice patterns in his neighbours and assign them nicknames. Eventually, Jeff observes some shady business across the way on a dark and rainy night – these events set him on an amateur investigation from the confines of his wheelchair. Alfred Hitchcock was one of the very first directors I became immediately attached to after being introduced to the magic of cinema. His films were darkly funny, intelligent, thrilling, and nearly all of them still felt modern and fast-paced when compared to modern Hollywood movies. Hitch’s love for the medium is obvious in every single one of his projects, good or bad. Seeing Rear Window for the first time absolutely floored me – years of seeing the story parodied and paid tribute to in pop culture somehow had not shaped my perception of the film. Hitchcock makes the most out of his single location setting, mapping out an entire apartment complex through the eyes of James Stewart’s L.B. Jeffries, whose boredom and need for entertainment drives the first act of Rear Window. Every character introduced through Jeff’s eyes is humorous, interesting, or peculiar in only a way Hitchcock could accomplish – while not developed, these characters still serve their purpose as fodder for the film’s central mystery. After Jeff witnesses what he is convinced is a murder, Hitchcock makes the audience question whether they believe Jeff, or if maybe our protagonist is going a little stir crazy. As soon as the murder plot is introduced, Hitchcock begins to slowly raise the tension by almost completely changing the formerly carefree and fun tone into a much more sinister (while still playful) one. Rear Window’s themes of voyeurism are titillating and incredibly compelling – especially for a film from the mid-1950’s. These themes reveal a great deal about Alfred Hitchcock’s unique sensibilities, giving audiences a dirty little glimpse inside the mind of the Master of Suspense. Living out some of these titillating voyeuristic experiences is James Stewart as the easygoing L.B. Jeffries. Hitchcock and Stewart’s collaborations always made for fun pairings, and Rear Window is probably my favorite in their partnership. Stewart’s “aw shucks” personality is for the most part non-existent in Rear Window, instead replaced by a still likable, but far more self-aware and relaxed performance. Supporting Stewart is the always delightful Grace Kelly, who carries some of the film’s most intense moments – becoming a heavily-involved accomplice of Stewart’s. Grace Kelly’s Lisa leads directly into Rear Window’s thrilling climax, which may be one of the most intense scenes in Hitchcock’s filmography – he makes perfect use of Jeff’s small, dark apartment, as well as our main character’s broken leg. When the moment finally comes, the entire audience are on the edge of their seats. Rear Window holds up as one of the best mystery films of all-time, and more than six decades later is still talked about as one of the greats. It’s a great starting place for those not familiar with Alfred Hitchcock, and anybody looking to get into classic films. I had the incredible pleasure of seeing Frank Capra’s remarkable Mr. Smith Goes to Washington on the big screen this afternoon, courtesy of Cineplex theaters’ Classic Film Series. It was my second time seeing the incredibly important and very timely Mr. Smith, and it inspired me to do some impromptu writing on the film. To my surprise, I was one of only three people in attendance for the screening, something that disappoints me greatly on the eve of Canada’s own Election Day. I hope everybody reading this gets something out of it, and decides to both see this important film and vote in tomorrow’s Federal election. James Stewart as Jeffrey Smith in Frank Capra’s Oscar-winning Mr. Smith Goes to Washington (1939). Frank Capra, one of America’s greatest directors in the 1930’s and 1940’s (his modern-day equivalent would be somebody like Steven Spielberg), coupled with the handsome, charming, and legendary actor James Stewart (whom Tom Hanks is often compared to) created three terrific and influential films together, including holiday classic It’s a Wonderful Life, Oscar-winner You Can’t Take it With You, and this film. Mr. Smith Goes to Washington tells the incredible story of a hero to the youth of America taking on the might of big business and all those who fall under their power. The film sees James Stewart’s wholesome Jefferson Smith be hand-picked to represent his state as a Senator in Washington, where he is quickly taken under the wing of Senator Joseph Paine (played by Claude Rains). Paine and his corrupt partner Jim Taylor (Edward Arnold) look to take advantage of Smith’s lack of political knowledge and his wholesome image and attitude in order to quietly pass a dam-building scheme held within an important appropriations bill framed by the corrupt Taylor. When nothing goes according to plan for the duo of Paine and Taylor, the two look to defame Jeff Smith’s image at any cost, having him kicked out of the Senate. The titular Mr. Smith, with help from his secretary Clarissa Saunders (played wonderfully by the incomparable Jean Arthur) hold a filibuster in the Senate as a last-ditch effort to save the land in Smith’s home state, and protect the interests of American’s everywhere. James Stewart pictured in the film’s famous filibuster scene, one of the greatest in American film history. Mr. Smith Goes to Washington is a remarkably written film, never slowing down for a minute and never going out of its way to pander to the audience. Though the film may be seen as overly sentimental or patriotic by cynical audience members, Mr. Smith is a relentlessly romantic and passionate film about the importance of freedom and the absence of corruption in the political process. It perfects the classic David and Goliath story that has been told time and time again, and yet still feels fresh, inventive, and meaningful. Screenwriter Sidney Buchman puts his heart and soul into this film, and it can be felt on-screen by Frank Capra’s impeccable direction and the terrific acting from the entire cast. James Stewart as Jeffrey Smith is a revelation, and perhaps one of the greatest performances of the era, if not of all-time. The filibuster scene – the real showcase for Stewart’s abilities – brought tears to my eyes, as did some of Jeff Smith’s passionate speeches given throughout the movie. Backing up Jimmy Stewart are the incredibly talented Claude Rains (known most famously for his performance in Casablanca three years later), Edward Arnold, and Harry Carey, all of whom put in very good performances, with Rains and Carey both being nominated for Academy Awards for their supporting performances. Jean Arthur’s performance is almost on-par with Stewart’s in that she’s an incredibly strong woman, something that was rare for Hollywood at the time. Arthur’s Clarissa Saunders never sinks to just being the romantic interest of our lead character, but instead coaches Smith into being a powerhouse of a politician, supporting him from behind the scenes. The writing, direction, and acting resulted in Mr. Smith Goes to Washington being nominated for 11 Academy Awards, and a film nearly 80-years old still holding up to this very day. I can’t stress how important Capra’s Mr. Smith is, especially at this point in time. It’s a film about the little man standing up to the bullies, liars, and cowards in big business and in politics, and standing up for everything he believes in. No matter what odds are stacked against him, he never gives up, and most importantly never gives in to the corruption going on all around him. We could all learn a lot from Mr. Smith Goes to Washington, and I hope that a film such as this can still inspire the masses to persevere no matter how bad things can look sometimes. It is a film so full of hope and passion in a time where we need it the most. Mr. Smith Goes to Washington is a masterpiece of American cinema, and one of my all-time favorite films. I cannot possibly recommend it highly enough. Highest recommendation.